Italy's Andrea Pirlo is the biggest threat to England's hopes of making a winning start to their World Cup campaign, says Roy Hodgson. 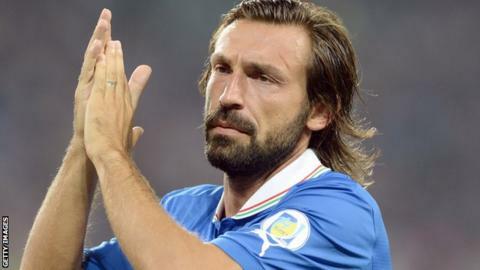 Juventus midfielder Pirlo, 34, was man-of-the-match when Italy knocked England out of Euro 2012, and the two teams meet again in their World Cup opener in Manaus on 14 June. "In the last 10 years, he has made Italy play," said the England manager. "We have respect for everyone but if I have to give a name, I say Pirlo." Hodgson, who managed Inter Milan in two separate spells, told Italian TV station Mediaset: "I had him for three months at Inter and he has had an incredible career." England take on Italy in their Group D opener in the Amazon city of Manaus, and while Italy are likely to start as favourites, Hodgson believes the hot and humid conditions will benefit neither side. "We are doing everything possible to prepare the players in order to deal with these conditions," he added. "It's not the best situation for us, but neither for Italy. "I don't think right now this even represents an advantage for any South American side." Uruguay and Costa Rica are also in Group D, alongside England and Italy.